IRBIL, Iraq -- ISIS extremists have reveled in destroying ancient shrines and antiquities, posting videos on social media of their vandalism. In an odd twist, however, they've inadvertently uncovered a treasure-trove of ancient statues and inscriptions dating back to the days of the Assyrian Empire. Iraqi government officials have confirmed the discovery of the ancient artifacts in tunnels dug by ISIS fighters in eastern Mosul. Iraqi forces have been battling ISIS to reclaim Mosul -- Iraq's second-largest city -- since October. Faleh al-Shumari, head of the Antiquities Authority in Mosul, told CNN that the Iraqi government found the antiquities by chance in the tunnels dug under the shrine of Nabi Yunis, Arabic for the Prophet Jonah, but they haven't extracted them yet. "We knew about these antiquities and artifacts situated under the Shrine of Nabi Yunis in eastern Mosul that date back to the eighth century B.C, the Assyrian period," Shumari said. The authority had done excavations there in the 1990s and also in 2004 and 2005, but the site was covered "as a result of lack of resources and as a result of the security situation," he said. "The immediate solution is to have these artifacts and antiquities excavated, pulled from underneath the ground and moved to a secure place like the Baghdad Museum or Mosul Museum, when it gets secured in the future -- when the security situation permits that." However, the tunnels are prone to cave-ins and collapse, making removal of the artifacts dangerous. ISIS took control of Mosul in June 2014, Its museum's artifacts and antiquities were completely destroyed and looted by the group in February 2015, but the building remains standing, Shumari says, and was used by the militants' police force, known as the Hasba. According to ISIS' warped interpretation of Islam, all idols must be destroyed. Its destruction of priceless antiquities and a series of ancient sites and religious shrines is highly offensive to many Iraqis, who are deeply proud of the country's rich history. Iraq is considered one of the cradles of civilization. Recent gains by the Iraqis in western Mosul have left pockets of ISIS militants isolated, and the city is largely surrounded by Iraqi security forces. The objects were discovered under the shrine of Nabi Yunis, also believed to be the Tomb of the Prophet Jonah, said Layla Salih, head of heritage building in Mosul and a member of the State Board of Antiquities and Heritage of Iraq. The site also includes the remains of the palace of King Esarhaddon, who ruled what is known as the neo-Assyrian Empire in seventh century B.C. Salih said the remains of the palace were found under the shrine of Nabi Yunis. 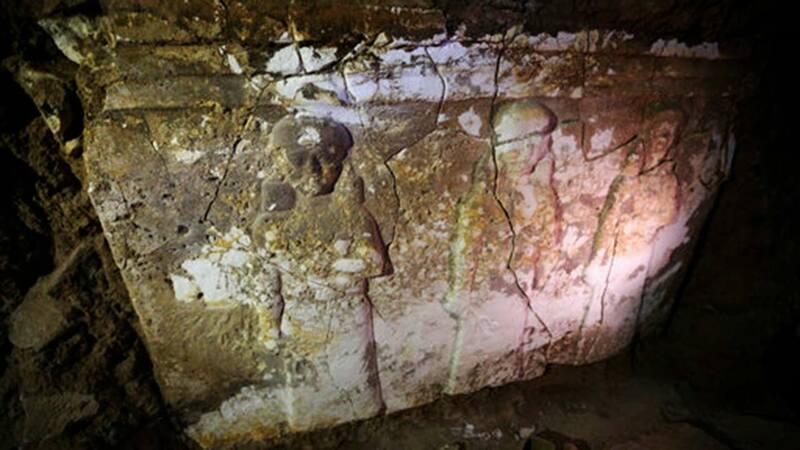 "Inside these tunnels we found two sculptures of the Winged Bulls of Nineveh and another two sculptures that had faces of four women, including 5 meters of bas-relief of one side of the tunnel walls with cuneiform inscriptions," Salih told CNN. She said the teams that explored the tunnels found fragments of pottery and parts of the winged bulls, known as lammasu. Two years ago ISIS militants posted video of men using sledgehammers to destroy statues and other ancient artwork in the Mosul Museum. Later Iraqi officials with the Ministry of Tourism and Antiquities said many of the statues were replicas, that the originals had been sent to Baghdad for safekeeping. In the ISIS footage, men shove statues off pedestals and use hammers and drills to destroy what's left. An unnamed militant offers the following explanation: "These antiquities and idols behind me were from people in past centuries and were worshipped instead of God. "When God almighty orders us to destroy these statues, idols and antiquities, we must do it, even if they're worth billions of dollars," he says. ISIS militants haven't always taken such a principled approach, however. Two years ago the FBI asked art collectors and dealers to be on the lookout for antiquities that the terrorist group could have put on the market as it plundered and destroyed archaeological sites across Syria and Iraq.